as much as i love this week's theme, i'd warned elisabeth this one was gonna make me sweat. but then, as per usual, i boarded a commuter train, both ways slow. 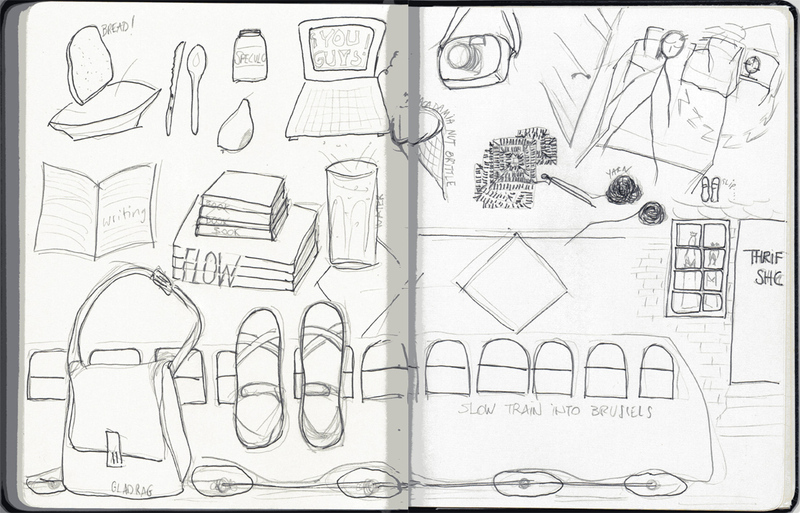 i set about in an unusual place, for my sketch book lay at home. i cooled down a bit, started... doodling. i've had to cut and paste a little, in order to get it all sorted out on the scan (sounds pretty nurse-y, don't it? ), and i advice all viewers to click and enlarge. if not, you may get lost in my hazy daily nitty-gritties. a thrift shop-a-day is no exception round here. sort of. in my dreams it is not! it's a good way of spending time while commuting. I used to doodle while on the phone, before the era of cordless and the cell phones. Oh that's so lovely ... I wish I was a better doodler (my drawing is shocking). I love, love, love your sketch of the purse! It belongs in a children's book illustration... beautiful. love the doodles. mine almost ended up the same way because i too freaked out a bit with this week's challenge. No one doodles like you Momma! Did you have a great time? I'm so in love with your handbag in the previous post! oh woolfie, i do love your doodles! you make me feel like a cheater! i don't know where my sketchbook is let alone any time to sit down and sketch. FLOW...very nice. the bus reminds me of when i was pulled off one enroute from Amsterdam in Brussels, the police thought my smurf sticker i got in Italy was suspicious! :) i think it was my wild hair and green suede shoes. Nadine, I saw this early this morning and have been thinking about it all day. I absolutely love the sketches with all of the fun details of your day. The composition is great too. I love to study such interesting drawings. Oh, I love your 'daily nitty-gritties', dear Nadine. And your doodle shows a lot of you... delightful. PS. You make me laugh with 'very well put'...!